The Sacred Peace Walk will walk through the heart of Las Vegas on Tuesday, April 19, starting outside the Atomic Testing Museum, including stops at the offices of the Nevada Site Office of the National Nuclear Safety Administration and the National Security Technologies, LLC which operates the NNSS for the Department of Energy.The rest of the walk will commence Wednesday from the junction of US-95 and NV-156, demonstrations and spiritual observances through April 26 will include vigils and demonstrations at Creech Air Force Base and the Nevada National Security Site, formerly the Nevada Test Site. Nevada Desert Experience, Veterans For Peace, Pace e Bene Nonviolence Service along with concerned citizens from all walks of life and faith communities. Bishop Dan Edwards of the Episcopal Diocese and Chief Johnnie Bobb of the Western Shoshone National Council will offer opening blessings on the group. 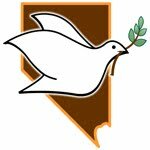 See the Nevada Desert Experience website for more details about the schedule and issues raised by the Sacred Peace Walk. By walking in Las Vegas, the Sacred Peace Walk participants will reach a cross-section of society from all over the country and world with the message that we need to liberate ourselves from the threat of nuclear weapons and power, and from the increasing reliance on new weapons systems which continue to cause untold accidental and civilian casualties. By walking from the museum which celebrates the work involved in making the atomic bomb and its role in the cold war and including stops at offices sites of Nevada National Security Site (NNSS) managers, the walkers are making the connection between the historical work at the NNSS and the ongoing support for war underway there and at nearby Creech AFB. Fukushima is an enormous wake up call for the world. Nuclear weapons, nuclear power and nuclear waste are profoundly dangerous and that other catastrophes cannot be avoided. The harm caused from mining, the inability to store wastes safely in the long or short term, from accidents, and from the threat of nuclear attack by the U.S. and others is bringing more people into a consensus against nuclearism. We sincerely hope a doorway to understanding will finally open so we may avert further calamity both at home as well as in the rest of the world. The events at Creech are done in solidarity with the Upstate (NY) Coalition to Ground the Drones and End the Wars, a group of concerned citizens from Buffalo, Rochester, Ithaca, Binghamton, Syracuse, Rome and Albany, have organized a week of education and action to protest the Reaper Drones at Syracuse’s Hancock Air National Guard Base, culminating in a rally at Hancocok Airfield, April 22 at 3pm. Recent incidents of children being killed while gathering firewood, killings of two US service-members by drones, and an estimate by the Human Rights Commission of Pakistan that 957 people were killed by US drone strikes in that country in 2010 all point to the drones as being a failure if the goal is to end hostilities. Nevada Desert Experience and Sacred Peace Walk participants walk because the evidence has continued to mount, against drones and armed robotics systems as untrustworthy and indescriminating. This entry was posted in 2011, press releases, Sacred Peace Walk. Bookmark the permalink.